We were all struck by the spectacle of the fire that destroyed the Notre Dame cathedral in Paris. As I was watching the coverage, somthing struck me, I began thinking about why this burning building caused so much grief and angst. One of the reasons was that we as God’s created beings, desire transcendence, we have a desire for something that endures beyond our lives. We desperately want to know that eternity is real and achievable. The thought that everything around us that we see will one day fall to decay is simply too hard for us to face (see Ecclesiastes 3:11). We were made for so much more than the accumulation of wealth, knowledge and the pursuit of comfort and happiness, we were made for eternal glory with Jesus. On Easter Sunday, we celebrate the fact that Jesus rose from the dead and that he paid the price for our eternal salvation. Isaiah 53 is one of the clearest Old Testament prophetic Scriptures that points to the death and resurrection of Jesus. These words also remind us that Jesus was not a victim of a terribly botched trial, or mistaken identity. Jesus was the creator God, who took on flesh, was born and lived at a specific time in history to die on a Roman cross and then to be raised to life. Only Jesus could do what He did, only Jesus who was fully God and fully man, was the one who could pay the price for the sins of man. Jesus is – the Perfect Sacrifice. Under the Law of Moses, there were multiple different offerings, the prophet Isaiah wrote that Jesus was a guilt offering. The guilt offering was to provide a way to be cleansed from unintentional sin, or a way to provide restitution when someone has been personally wronged because of a sinner’s actions. Jesus knows what sins we have committed in the past, but the guilt offering was for unintentional or yet unknown sin. On the cross, Jesus paid the price for our sins and for the sins we are yet to commit even our unintentional sins. Does this mean I sin without consequence? Absolutely not, it was our sin that drove Jesus to the cross, past present and future. Jesus is the perfect sacrifice, the only pure spotless lamb of God (see Hebrews 10:11-14). Jesus is – the Risen Lord. Only living people see their offspring, only living people have extended days and prosper. This is the line in the sand that differentiates Christianity from any other world religion. Our God is alive, the tomb where he was buried was only occupied for a few days. Paul clearly stated this in 1 Corinthians 15:3-6, this is the Good News, he is risen! Not only that, Jesus was raised with a body that will never decay, the same kind that we will also get one day if we believe in Jesus as Lord. The resurrection of Jesus is our glorious hope of a certain eternal future. Jesus is – our Righteousness. The word righteous means that there is no longer a need for justice or punishment. For the Christian, to be righteous means to be in right standing before God. This is the privilege that we have as those covered by the perfect sacrifice of Jesus. We cannot stand before the all-holy God without the righteousness of Christ. Without the righteousness of Christ, we have no hope of any sin being forgiven, but because of what he had done, no sin is too great for his forgiveness. In Jeremiah 23:6 we read that Jesus is Jehovah Tsidkenu, meaning Jehovah is our righteousness. Our being in right standing with God is only because of us placing our faith in the completed work of Jesus on the cross. Righteousness comes through faith. The Bible is full of references to the inheritance believers have in Christ (see Ephesians 1:11). Our inheritance is the sum of all God has promised us in salvation. Our inheritance is not dependent on our works, our inheritance is based on our family, being part of the family of God, being a Christian makes us heirs along with Christ (See Romans 8:16-17). When we understand and value the glory that awaits us, we are better able to endure whatever comes our way in this life. With an eternal perspective, we realize that this life is gone in a flash and eternity awaits us all. We can praise God during trials because we have His guarantee that we will receive all He has promised (see 2 Corinthians 4:17). An advocate is someone who pleads the cause of another before a court or tribunal, Jesus is our advocate (see 1 John 2:1). Jesus, the creator of the universe, gave his life for you, and now he is seated next to God the father and he is pleading and advocating for us (see Hebrews 7:23-25). In addition to this, Jesus is the King of Kings and Lord of Lords! Have you ever been to an event or meeting and something happened that you didn’t expect or fully understand? The Sunday prior to Easter is Palm Sunday, the day when we traditionally remember Jesus coming into Jerusalem one week prior to his crucifixion and resurrection. Everything that Jesus did on that day made a statement, he was intentionally dropping hints along the way about his identity and intentions. Those witnessing the events, did not see the significance of what Jesus was doing. Jesus was following a script that had been written before the creation of the world (see John 5:19). 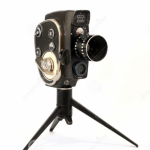 Jesus avoided the limelight, throughout his public ministry. Most of Jesus’ ministry happened outside of towns or in small towns, away from the center of Jerusalem. But on Palm Sunday, all of that changed. In Matthews Gospel account we see six signs that Jesus left indicating his identity and purpose.The first sign we see is that Jesus instructs his disciples to go and get a donkey and her young foal and bring them to him. His disciples dutifully obeyed and went and got him this wild animal that had never been ridden before. Riding into the city was a public declaration that Jesus was a king (See Zechariah 9:9). In times of war a conquering king would ride on a chariot or a stallion, but Jesus rode on a colt to declare that he is a king proclaiming peace. But aside from the obvious declaration, this animal had never been ridden before. Anyone who has worked with horses before would know that you cannot simply ride a wild foal, it needs to be broken in, unless the creator of the foal was the one riding. The people didn’t recognize the creator God, but the foal did, the animal knew who was riding on its back, and it submitted to the authority of Jesus. The people reacted by spreading their cloaks in front of Jesus, this was a sign of honor for a king as we see in 2 Kings chapter 9. 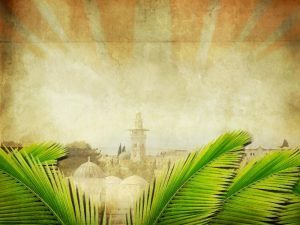 The fact that the people were waving palm branches showed that they didn’t grasp who Jesus was, and why he was coming to Jerusalem. Two generations before this time, the Maccabean revolt took place that liberated the Israelites from the Syrian oppressors, at that time the worship in the temple was re-established. By waving palm branches, the people were expecting a military ruler to free them from the oppression of Rome, they expected Jesus to be another warlord or general of the armies, one who would lead them to liberation from their oppressors. They were ready to pick up their swords and go to war if Jesus would lead them! In verse 9 we see that the people were crying out, “Hosanna to the Son of David! Blessed is he who comes in the name of the Lord! Hosanna in the highest!”. The crowds were full of expectation that Jesus was coming to save them, but it was originally a cry for help. The people were misguided in their expectations of Jesus as the military messiah, but their declaration of Hosanna, was a prophetic declaration of the salvation that Jesus was about to bring through his death and resurrection. We easily miss the significance of what Jesus was doing, he was making a public statement that the sacrificial system was not needed anymore, he was about to become the perfect and final sacrifice for all who would put their faith in him. Jesus was passing judgment on the sacrificial system. Even today we still need to be reminded that there is only one sacrifice that gains us favor with God, and it has already been completed when Jesus died and rose again. In verse 14 we read, “And the blind and the lame came to him in the temple, and he healed them.” During the chaos and confusion, Jesus takes time to heal the blind and the lame. Jesus was intentionally making a declaration of his true identity. The irony is that the seeing people were the blind ones. The blind came to him, because they recognized him for who he was. Remember at the beginning of Jesus’ ministry, he went to the synagogue in Nazareth and read from Isaiah chapter 61 (see Luke 4:18-19). Jesus was declaring who he was, but the seeing were blind. The priests were very religious, but religion – a set of rules and regulations to earn salvation – that is not for children. Christianity is a true relationship with our heavenly father through Jesus Christ and children get that much easier than adults do. Jesus quotes King David from Psalm 8:2. There is power in the praise of children, but more than that, the children hear from God much clearer than we adults do. The children are the faith and prophetic voices for the church as we get so busy “doing church”. We get so busy doing religion, that we miss the power of the praises and prayers of the children. Jesus made statement after statement, declaring his true identity, but all the people in Jerusalem that day missed what he was saying. Perhaps you follow Jesus because of his miracles and what you can get from him? Do you follow Jesus because it is your tradition? The only way of salvation is through recognizing who Jesus is and then submitting to him as Lord of your life. Anxiety is the most pervasive psychological problem in our society, however, studies have shown that 90% of what we worry about never happens. Anxiety is largely about perspective. Marketers and politicians know this all too well, using it to their advantage. Today, get anxious about things they haven’t seen but have heard about on the internet. Fear prevents many Christians from experiencing all that God intends for our lives. Satan uses anxiety to create a cowardly, joyless soul. Fear wants you to take your eyes off the mountain peak and settle for the dull existence of the flat lands. But Satan has been overcome and Jesus won the victory on the cross (Hebrews 13:6). In Philippians 4:4-7 Paul addresses anxiety and it is very practical and transformational as we apply the principles of God’s word. Jesus, while preaching the sermon on the mount, took a significant portion of his discourse to address the futility of anxiety (Matthew 6:34). The Apostle Paul knew what it was like to experience hardship, he was in chains as he wrote this letter. He had every reason to be anxious, but rather he is full of joy and encouragement. Paul starts verse 4 by making an imperative statement, “Rejoice in the Lord always; again I will say, rejoice.” There is a huge difference between joy and happiness; joy flows out of security in a relationship. There is a direct connection between joy and love. Gaining a greater understanding of the love that God, your Heavenly Father, has for you, will give you peace and joy (Habakkuk 3:17-18). Paul had the same confidence as the prophet Habakkuk, Paul was convinced that God was in control and that God would fulfill the promises of His word (Romans 8:28). Do we have that same confidence? Or am I anxious because deep down, I am not fully convinced that God is able, that God is truly good. When we really search our hearts, the root of anxiety can be traced to unbelief in the all-powerful creator of the universe. We as followers of Jesus are to be known as people who are reasonable. But not just reasonable, the Greek word incorporates all the fruit of the Spirit (Galatians 5:22-23). As we live the Spirit-filled life we will exhibit these qualities to those around us. The key to overcoming anxiety is prayer. Paul makes an imperative statement, “do not be anxious about anything”. Anxiety leads to multiple physical maladies, prayer is the Biblical prescription for the illness of anxiety. 1: Prayer – Is the attitude of the person coming before the all-holy, all-powerful creator. Prayer is by nature humility, a recognition of who we are communicating with. Prayer never begins with words – it begins in the heart, a humble attitude towards God. Prayer is stepping away from the rushing world, trying to do it myself, a place where I am the problem solver, and throwing myself with dependence and recognition on the Creator of the universe. But so much more than this, we as believers in Jesus Christ can call the Creator, Father! This is prayer. 2: Supplication –Sharing our needs and problems with God. Not because He doesn’t know what we need, but rather because as we verbalize our needs, God works in our own hearts and prepares us for the answer to our prayers. God uses the prayers of the saints, His children, to change things. God doesn’t need our prayers, but He responds when we pray, because that is the way He has ordered the universe. We have a vital and powerful part to play through prayer. Prayer is a declaration of faith, because by presenting our requests to God, we are stating that He is able (Hebrews 11:6). 3: Thanksgiving – This is crucial, thank God before you have received the answer to your prayers. All prayer is to be accompanied by thanksgiving. Thankful that God has heard our prayers, that God is moving on our behalf, that God has answered our prayers. We are to be thankful because God is going to give us exactly what we need in response to our prayers. Satan’s lies, cannot exist in a life full of thanksgiving. Thanksgiving is Worship, putting God in the place of preeminence. Through prayer, we can experience the peace of God, a miraculous work of God bringing peace to the heart and mind of the believer. It does not mean the absence of trials, Jesus said we would still have that (John 16:33). The peace of God is the ability to handle the trials without them stealing our joy. This is supernatural, this is too much for us to grasp, “it surpasses all understanding”. This is the peace that makes the people around ask how we can remain calm during the storms of life. This peace is the result of the person who has taken everything to God in prayer, with thanksgiving. This peace of God will also provide a guard for our hearts and minds. the peace of God is a protection against anxiety, stress and against bitterness towards those who have wronged us. The peace of God is a guard and a protection against the lies of the enemy. Verse 7 ends with the key, the key to this peace and joy is found in Christ Jesus. Only in the completed work of what Jesus did on the Cross and by his resurrection power are we able to experience the peace of God. Have you ever had an argument with a fellow believer? What was the fruit of that argument? 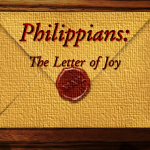 In Philippians 4 we read about two women who had a disagreement in the church in Philippi. These women were gifted leaders, who’s argument had the potential to create division in the church. The Apostle Paul addressed the issue directly because he saw the bigger picture, the eternal implications. We need to have an eternal perspective on disagreements, if someone is turned away from the church because of a personal disagreement and that person rejects Christ as a result, they will spend eternity in Hell. “my brothers, whom I love”, the Greek word he uses is agape, which refers to the love of God that has been given to us through the Holy Spirit (see Romans 5:5). This is the love that God gives us for each other in the Body of Christ. Without the agape, “love glue”, the church would simply not be able to stay together while on mission. “And long for”, Paul is approximately 800 miles away, he misses his family, longing to be with them. “my joy and my crown”, not only does he love them and miss them, he celebrates them. The members of the church in Philippi were his favorites, and his crown. 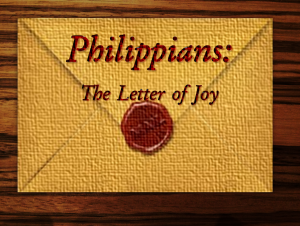 Paul writes that the Philippian church was a reward for faithful service. How often do we celebrate our brothers and sisters in Christ? Sadly, as a culture we only celebrate someone at their funeral. Let us be Christians that celebrates on another, speaking life and encouragement over each other, this will bring joy and unity to the church. Paul writes in verse 1 encouraging the Philippian believers to stand firm, standing on the truth’s that they have been taught. We need this encouragement today, we need to stand firm, unwavering on the truth’s that we have in God’s unchanging word. Standing firm is a Roman military term of standing guard against any attack from the enemy. The implication is that the victory has already been won, Jesus won the victory on the cross and we are to hold the ground that he conquered as we declare the truth of the Gospel. 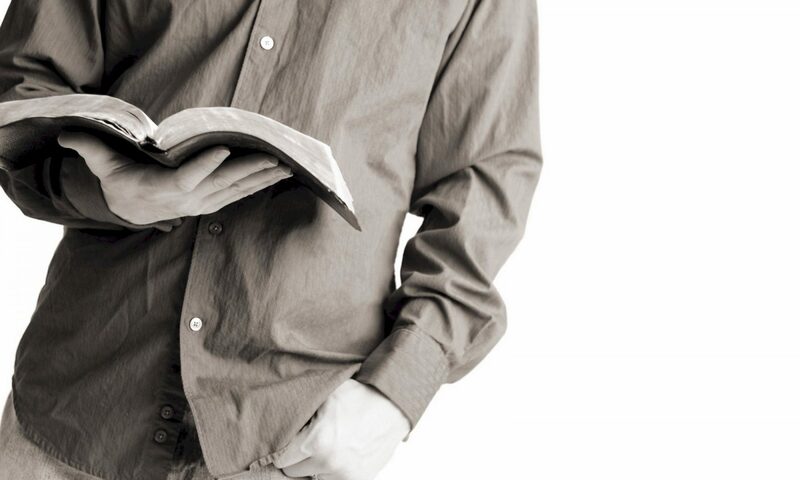 We stand firm by holding to the Word of God, not twisting it to be acceptable to culture. We stand firm by loving God’s people. We stand firm by loving the lost. We stand by obeying what God tells us to do, even if it seems crazy to those around us. In verse 2, Paul calls out two women, Euodia and Syntyche who were engaged in a fruitless argument. We don’t know anything about their dispute, but since Paul mentions them by name, it must have been a severe threat to the unity and the ministry of the church. Not taking sides, Paul pleads with them to end their disagreement. Paul knows that this argument is a threat to unity. As believers, we can be right in an argument, but we have no right to create disunity in the church. This does not mean that we forgo standing firm on foundational Biblical truths, but when an argument is a difference of opinion regarding secondary church issues, church unity and fellowship is more important. Paul pleads with them to agree in the Lord. Essentially what he is saying is that their vision is too small. So often we disagree over secondary things, because we have forgotten the glorious purpose of the church, to proclaim the Gospel to every tribe and people group to the ends of the earth. Satan loves to have the church fight over styles and colors and vehicles, all the while we are distracted from the primary purpose of our existence. What opinions do you need to let go of today that are hindering the ministry of the church? Then in verse 3, he appeals to an unnamed person, someone he could trust to help these two women come to forgiveness and restore their relationship. This person, most likely a woman, may have been Lydia, who was the first Philippian convert. Early scholars suggested that this may have been Paul’s wife. Whoever this was, Paul was appealing to her to help bring restoration of the relationship between Euodia and Syntyche. These two women were dedicated committed believers, who had served to advance the Gospel, but now they were wasting their energy on a fruitless argument. Not only that, they were also robbing themselves of joy. When you have a disagreement with someone and you refuse to forgive them, you are the one who suffers the most. You are robbing yourself of joy and even possibly your health. Paul gently rebukes them, while at the same time he lovingly affirms them. Paul knows they are saved, but that they were not living out their calling and their fullest potential because they were living with unforgiveness. It’s not that they didn’t know Christ, but for a time, they had stepped away from the Lordship of Christ in their lives. This can happen to us at any-time as we fall into sin by giving in to temptation and step out of the Lordship of Christ over our lives. As soon as the Holy Spirit convicts us, we need to quickly repent and ask Jesus to forgive us of our sins (See 1 John 1:9). Realistically we will always have disagreements in the church over matters of opinion, but we need to quickly repent and seek restoration, always remembering the mission, the greater purpose of the church. Who do you need to ask for forgiveness?